Does Fx 22 nightly look too large? This patch 844604 – Text is too small on hidpi displays should have hit today's' nightly. Fx22 now uses the OS DPI instead of Fx using their own. This might result in larger text and graphics (might be blurry) in the UI and the content especially if you use a DPI greater than the default of 96 and also if you are using the Zoom feature of Fx or an add-on. While I don't mind this change for content (you'll have to change any custom zooms you might have for web pages) I don't like that the UI has increased in size. Bookmark buttons are now blurry because they are upscaled from 16x16 as are the other icons. You'd think that they would have tried out the patch on a large monitor with a high DPI first. I don't think the devs really have a grasp on this problem. Using the OS DPI for content is OK but when it comes to the chrome it's not. The chrome scales fine no matter what DPI you use without the patch. Holy crap this looks terrible. I'm using 150 dpi at 1080p and everything is way too big and blurry. Had to revert back to Aurora. If this is going to be a permanent thing I may have to switch browsers. I hope they realize their mistake and fix it. Edit: I was able to disable scaling by setting layout.css.devPixelsPerPx to 1 instead of -1. Now everything looks like it did before the change. Last edited by StinDaWg on March 16th, 2013, 9:27 am, edited 1 time in total. At least a new pref was added to get things back to the way it was before. The new pref is 'layout.css.devPixelsPerPx'. -1.0 makes Fx use the OS DPI. This is the default. 1.0 makes Fx use the original method of handling DPI. This will make things look normal again. If you set the pref to a 2.0 everything will zoom 2x. A 3.0 will zoom things 3x, etc. You can use decimals (1.5). Using something like 0.5 will make things twice as small. Testing out right now the newest Nightly UX Build.. That is not only Scary.. No, its horrible like hell. Have changed that about:config value now to 1 - Much better. I just hope if the Firefox Defs REALLY plan to use that blurry mess as "Quality Standard" for Future Releases, that that about:config option at least stays to change all back to the "normal and much more beautyful" size. Unless the bug gets backed out, the sizing probably won't change. 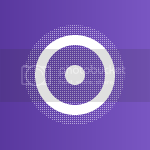 However, the blurryness should be solved as they add appropriately sized icons for the various scale factors. Apparantly you have never tested Alpha 1 builds before. I hope you are not relying on 22 as your work browser. Every day there will be something broken and they are not always secure. This change, IMO, wasn't given much thought. IE10 does not rely on the OS DPI at least for content based on side by side comparisons of Fx22 and IE10. While IE10's UI is big I don't think it is because it is using the OS DPI. Using the OS DPI is like setting every page in the 'old' Fx to Full Page Zoom of 125% and the chrome as well. This makes for blurry graphics that don't have the resolution to meet the DPI. The way Fx has been working all these years is just fine. With an addon like NoSquint I can tailor pages to produce the best looking output. NoSquint lets you set text zoom and full page zoom together unlike the default zoom feature. What is needed is a fundamental change in web design to account for different DPI's mainly because folks are using larger and larger monitors these days. I don't even know if this can be done, having every page display perfectly no matter what the DPI or monitor size you use. It works for Windows itself when you set a larger DPI. Windows adjusts things OK. Yes, some programs still have problems with a DPI >96 but this is becoming less and less. Hey, us users bitching about the change of color of unvisited links got it backed out real fast. Devs thought it was a good idea because other browsers are using that color. streetwolf wrote: This change, IMO, wasn't given much thought. IE10 does not rely on the OS DPI at least for content based on side by side comparisons of Fx22 and IE10. While IE10's UI is big I don't think it is because it is using the OS DPI. 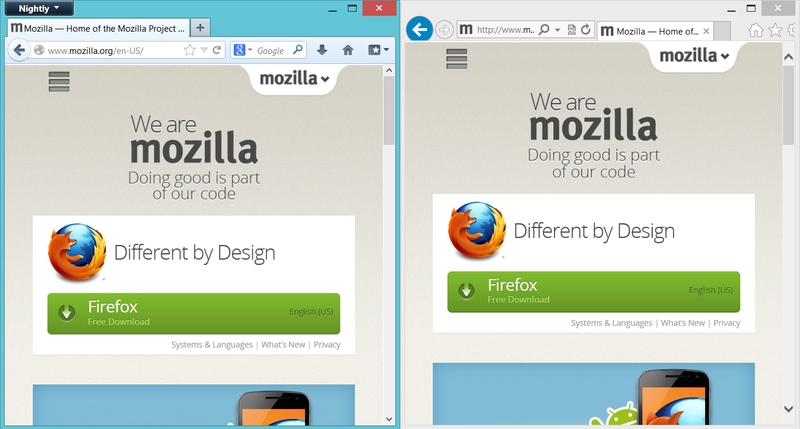 Here is a side by side comparison of Nightly and IE10 with DPI set to "Smaller" ( 100%, the default ). Both browsers were using their now default settings in each test. That means layout.css.devPixelsPerPx set to -1 and no modifications to zooming. 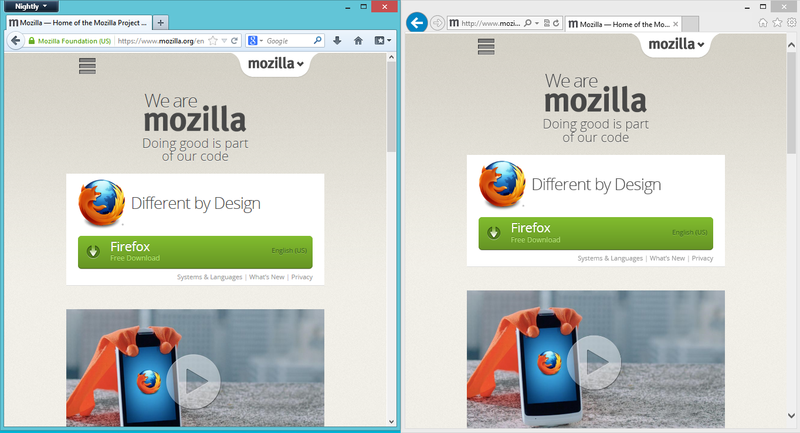 As you can see, Firefox and IE10 now act the same way. They scale both fonts and graphics according to the DPI setting. This scaling affects the UI and content the same way. The previous way was most definitely wrong. The only issue I see is they do not yet have higher resolution images for high DPI modes so the graphics in the UI get blurry. They are already aware of this, and it is being rectified. Part of my discussion with the Devs on this issue was they stated that all browsers used the OS DPI to scale their web pages. IE10 does not. It uses it's zoom feature like Fx without the patch does. One reason that this patch was created was to retain parity with other browsers. IE10 at least does it the way Firefox did until the patch. Apples and oranges. Your IE10 zoom default might be at 125%. Try IE10 at 100% zoom. Compare that to FX22 also at 100% zoom. We want to compare both browsers at the same zoom level to see if IE10 uses the OS DPI which it doesn't. Therefore one reason for this patch is a wrong assumption. I think you're just overreacting because you're not used to the change. I've been using this feature for months now on my 1080p 12.5 inch laptop display set at 150%. I don't know what I'd do without it. I don't think you understand. Nightly and IE10 do have the same behaviour. However, both browsers just express to the user what the zoom level is in a different way. If your DPI is set at 150%, both browsers zoom into a Web page by 150%. However, only IE10 reports it as 150%. That is just a design decision by Microsoft. If you believe Mozilla should make the same design decision, file a bug so that Gecko reports the "correct" zoom factor at different DPIs. Well it looks like dog poop on my 24" 1920X1200 monitor. When it comes to our monitors we ARE talking apples and oranges. Try it out on a 24 incher or larger and see if you still feel the same way. I'm not sure but I think the patch was originally thought out to provide better looking output on tablets and the like. It seems like it worked for you but for desktop users it doesn't fair as well. I think the Internet World is all about Mobile devices now. Time has passed me and my 6 year old XP laptop by. JayhawksRock wrote: I think the Internet World is all about Mobile devices now. Time has passed me and my 6 year old XP laptop by. Seems that way. There are more patches for mobile devices than for the desktop. I think this DPI patch was intended for smaller devices.